OB-GYN Dr. Brian Retherford recently operated on a patient who traveled six hours to Memorial Hospital, a critical-access hospital in Douglas, Wyo., because the 25-bed facility offered da Vinci robotic surgery as an option for a routine hysterectomy. There are no available statistics on how many critical-access hospitals and other small hospitals have purchased a da Vinci Surgical System. Cost is certainly an issue. In addition to the purchase price, the system has an annual service contract that costs between $100,000 and $170,000, and each procedure costs about $1,200 to $2,000 more than a laparoscopic operation because of the need for single-use tools. Insurers, however, pay the same rates for robotic and laparoscopic procedures. To make buying a da Vinci financially viable, hospitals generally need to perform 150 to 300 procedures annually for six years to offset the upfront and ongoing costs of acquiring it, said Vijay Kumar, associate managing director for ISI Group. Intuitive Surgical, which declined to comment for this article, no longer reports a breakdown of the types of hospitals that own and operate its systems. But a 2010 Wall Street Journal article reported that 131 hospitals that had installed da Vinci systems had 200 or fewer beds. Overall, about 1,500 U.S. hospitals have installed the da Vinci Surgical System since it came to market in 2000. 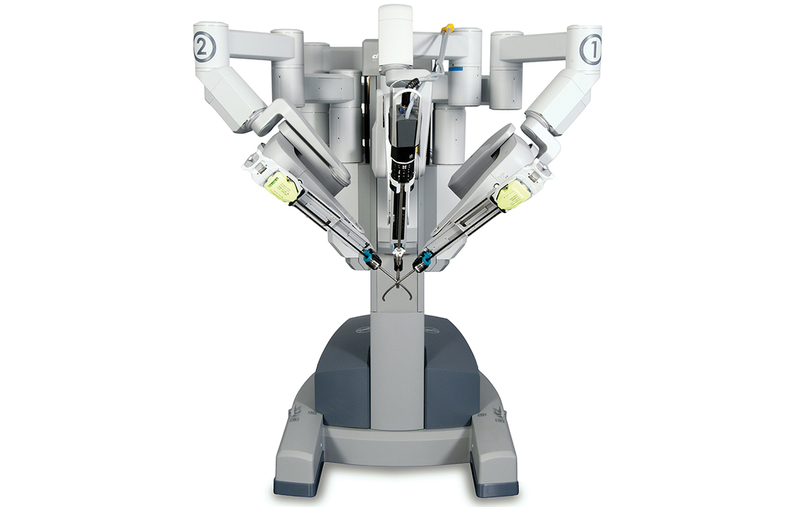 Intuitive offers the only robotic surgical system approved by the Food and Drug Administration. Analysts say younger surgeons want to work at hospitals that have a da Vinci, and patients may prefer a hospital that has one because they see it as a state-of-the-art facility. Market analysts say smaller hospitals face pressure to buy the da Vinci system because many new surgeons in training, particularly those in urology and gynecology, receive robotic surgical training as residents and want to work at hospitals that have the technology. And patients may choose a hospital with a da Vinci system based on the perception that it's a state-of-the-art facility. Hospitals of all sizes say they are developing credentialing programs and limiting access to the system to the most experienced and skilled surgeons. Training and credentialing are a big concern because there is a steep learning curve in using the da Vinci system, with a risk of serious injuries to patients if surgical mistakes are made. Experts say surgeons need experience with 20 to 30 robot-assisted procedures before they are adequately trained. But when surgeons at a smaller hospital don't reach the estimated proficiency threshold, that raises questions about the adequacy of their experience. “It becomes even more difficult to justify this decision,” Tiernan said. North Valley Hospital, a 25-bed critical-access hospital in Whitefish, Mont., has 11 surgeons trained in robotic surgery, including seven surgeons recruited since the hospital implemented the robotics program in 2010, according to a hospital spokeswoman. It performed about 250 robotic procedures last year. When it bought the system, it was the only hospital in northwest Montana to have a da Vinci, though Kalispell Regional Healthcare has since acquired two da Vincis. “If a hospital makes that decision, they need to consider all of the variables, which includes taking a look at efficacy and cost-effectiveness and really make sure they hammer out their training programs,” said Chris Schabowsky, senior project officer for health devices at the ECRI Institute. Meanwhile, Intuitive Surgical is facing pressure to pump up sales. In an April 8 preview of its first-quarter results, company officials braced investors for a 24% decline in revenue as fewer hospitals invest in robotic surgery systems. Intuitive said it sold only 45 da Vinci systems in the U.S. in the first quarter of 2014, compared with 115 during the same period in 2013. Full company earnings are scheduled for release April 22. There were 240,000 robot-assisted gynecologic procedures in 2013, compared with 222,000 in 2012 and 170,000 in 2011. Nearly 80% of prostatectomies performed in the U.S. now use the da Vinci system. The company attributed lower gynecological-procedure growth rates last year to market saturation, pressure on hospital admissions, negative media attention and insurers pushing for conservative treatments and more treatments in outpatient settings. This month, the company said it would book a $67 million pre-tax charge related to an expected product liability settlement that will resolve claims that patients suffered complications from its monopolar curved scissors, which were recalled in 2013, and the scissors' first-generation tip covers, which were withdrawn from the market in 2012. The American College of Obstetricians and Gynecologists issued a strongly worded statement last year urging women to separate “marketing hype from the reality” when choosing a surgical approach to hysterectomy. “There (are) no good data proving that robotic hysterectomy is even as good as—let alone better—than existing, and far less costly, minimally invasive alternatives,” ACOG President Dr. James Breeden said in a March 2013 statement.